Bring nature indoors with these wonderful porcelain mushroom lamps inspired by nature! This series includes a Chanterelle Mushroom Lamp and a Porcini Mushroom lamp. Most mushrooms grow in the dewy dark but these fine porcelain mushroom lights flourish with light. 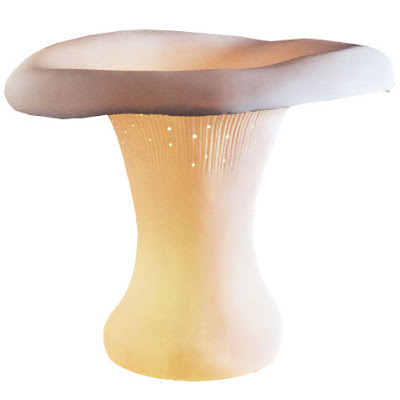 Putting the "fun" in fungi, spores of illumination pour out from under the caps of the matte porcelain Chanterelle lamp. This captivating table lamp will look grand in both traditional- and modern homes. These beautiful lights create a warm atmosphere and almost festive glow in any room. Bulb included. 10 watt max. UL listed components.